A white wolf seemingly beckoned to me. It was not in a friendly, warm way. I remember clearly his fangs. Yet, I knew not to be fearful. He paced in front of our white garage, waiting for me to exit our house and follow him. I will never forget the white wolf. 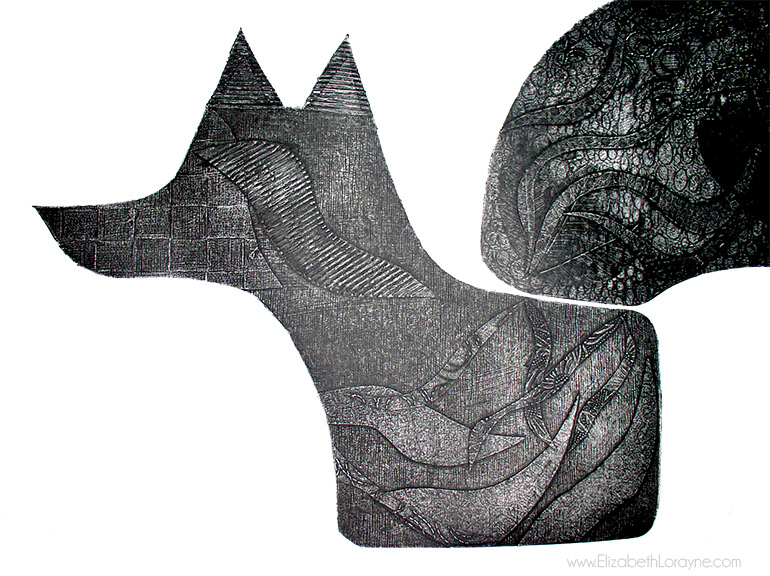 And thus, I became inspired to create a wolf-like collagraph. 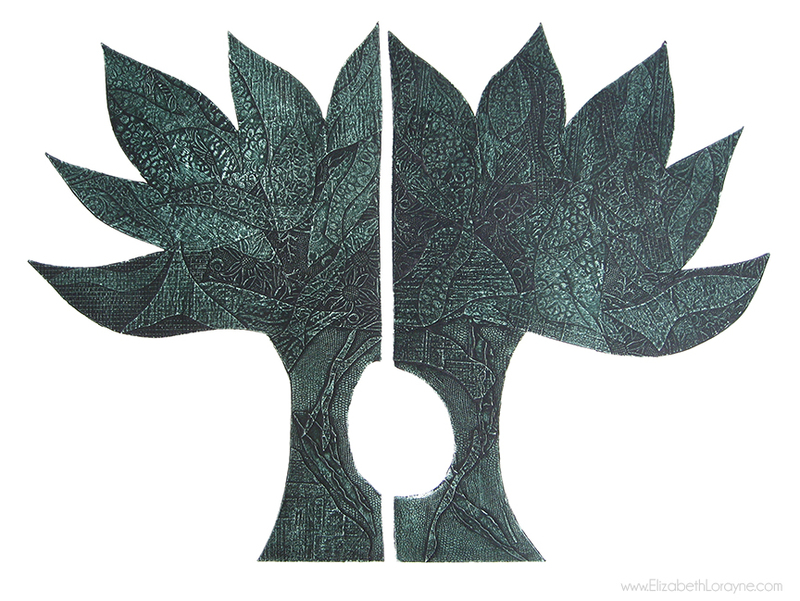 It would be my second attempt at an organic, uniquely shaped collagraph plate (therefore not just a 9″x12″ rectangle, for instance) The first unusual collagraph plate was my cut out tree (see below. More on that another time!). I felt incredibly excited to work on my idea. One night, shorty after falling asleep, I lightly stirred, partially awaking with the vision of adding a wing to the wolf. I rolled over, embracing the winged wolf and eventually fell back to seep. 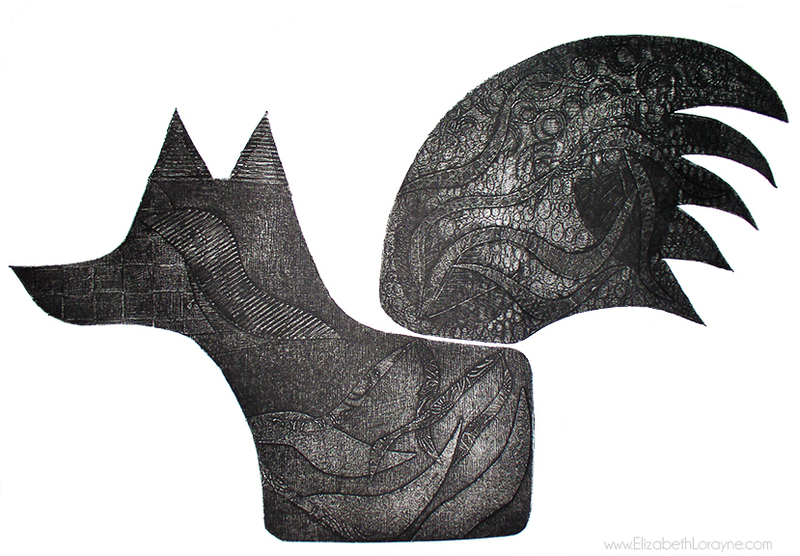 I set out as soon as I could to begin creating these collagraph plates. As seen in these two photos, my first impression of “Fox in Flight” went fine enough. He was actually a bit difficult to ink. I used various sized wood blocks, wrapped with masking tape (sticky side up) to help keep him in place as I both inked and wiped him. Unlike inking and wiping a “heavy” zinc or copper plate, my collagraph plates are rather light therefore, without mounting them, I wouldn’t have been able to prepare them for the press. The process itself of inking and wiping the plate always felt invigorating and very personal. I often felt as though I was truly bonding with the plate, learning how much ink to smooth on and which areas would need extra attention while wiping the ink. It was quite meditative and I always appreciated my instructor playing Classical music in the background. I was happy with the initial impression, but felt he needed some reworking. I trekked home with the fresh impression and my plates, to tackle adding more textures to my wolf inspired beast. 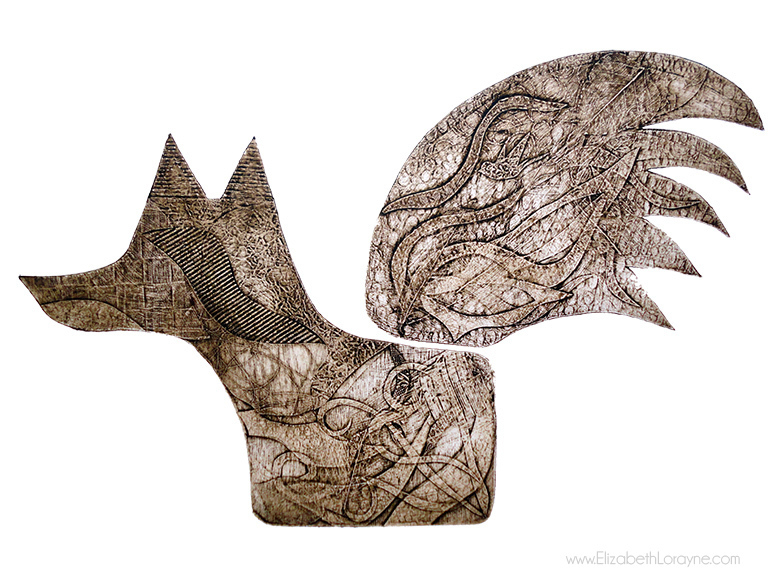 I realize this piece was based on my calling from a white wolf, yet I’d named it “Fox in Flight.” Well, he just ended up looking more like a fox. Looking back, maybe it was disrespectful of me, but I now feel it only gives me the opportunity to make more wolf inspired art. Because I do very much still feel a need to do just that.